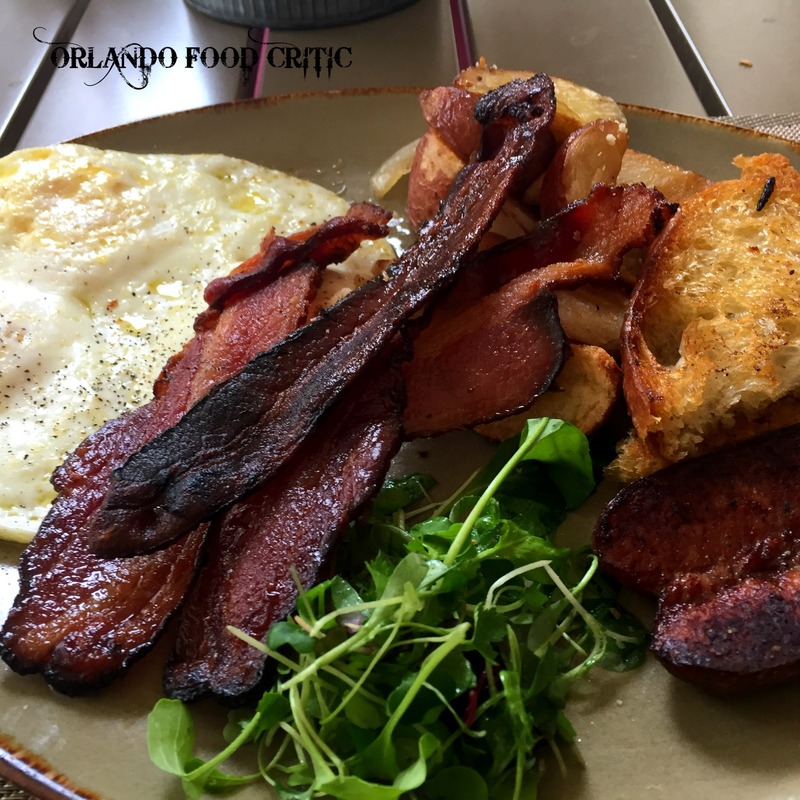 Hamilton’s Kitchen – 300 East New England Ave. Winter Park. I have stayed at the Alfond Inn on many occasions, but never actually dined there, except for a snack and a glass of wine or two in their excellent hotel bar. So, when the restaurant announced that it was increasing the availability of their phenomenally popular ‘Brunch” menu (one of the hottest reservations at the weekend) so that it is now available every day, then the lure was too hard to resist. Hamilton’s Kitchen is situated to the right of reception as you enter the Alfond Inn lobby, or alternatively it has its own entrance on the corner of New England Ave and Interlachen Avenue, and only a short walk from Park Avenue. The restaurant was named after Hamilton Holt a past President of Rollins College and they report that they serve up a distinct Central Florida experience with the rustic charm of a bygone era. Our visit was on a cooler day, so we chose to sit on the patio outside and take advantage of the Fall weather. Shields was our server and he presented the Brunch Menu and took care of our drinks and initial questions with a polite and friendly manner. He took our meal sections with the comment “What delicious and Exciting dishes can we prepare for you today?” without a hint of irony and truly made us feel appreciated. Throughout the meal Shields was the eminent professional and a credit to Hamilton’s Kitchen, I would go back just for the “Banter” we had with him. The menu is a new version of the traditional Brunch fayre that has previously been served at Hamilton’s and seems more extensive, with some interesting choices and selections. Farmhouse Platter –Three eggs any style, served with Skillet potatoes, Smoked sausage or Bacon and Old Hearth English Muffin. For me any excuse to have eggs and bacon is a good day so went for sausage and bacon, both were soft smoked and added a Southern feel to a great breakfast dish. 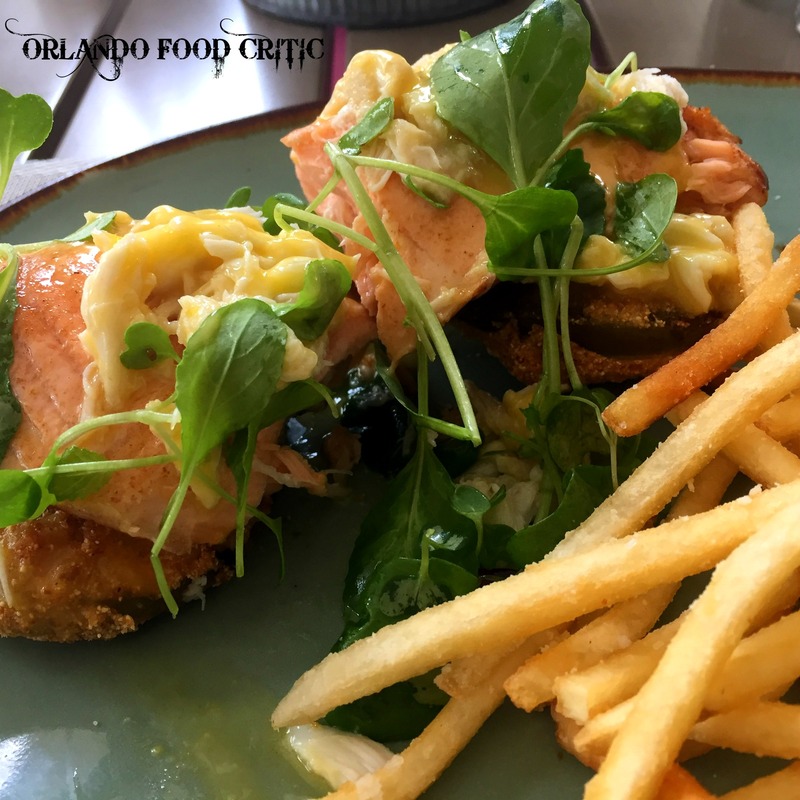 Savannah Salmon – A fillet of Salmon on Fried Green Tomatoes, with Blue Crab Hollandaise, Local greens and a choice of side. Our choice being crisp shoe string fries. Normally I just like my Salmon “au naturel” but in this instance the Blue Crab Hollandaise added and extra flavor level to the dish and took it up a notch or two. 12 Year Macallan Butterscotch Pudding – This was an Amazing dessert! Great hints of the Macallan Scotch Whisky in a delicious pudding mouse, topped off with whipped cream. But the show stopper was the salted caramel chocolate that adorned the top of the pudding. There were other brunchy style items on the menu such as: Belgian Waffle, French Toast & Berries as well as Street Tacos, Local Rock Shrimp & Grits to name but a few of the menu selections left to try at another date. Get the 12 Year Macallan Butter Scotch Pudding, if only for the Salted Caramel Chocolate, let me know what you think. Bread service, although not on the menu they have some great rustic bread with Olive Oil and Balsamic dip. Why go to Hamilton’s Kitchen? Well, besides the great service and a very good Brunch menu, the setting and ambience are unique. I love sitting on Park Avenue, with all the hustle and bustle, but occasionally the tranquil surrounds and ambience of Hamilton’s Kitchen is a welcome change. Hotel restaurants can seem very stuffy and clinical but Hamilton’s lives up to its ambition to be an inviting space where new relationships can be forged and old ones revived over some great food and drink. A great idea and one that I will undoubtedly take on board again.